O.B. Hardison Jr. (October 18, 1928—August 5, 1990) is the author of two books of poems, Pro Musica Antiqua (1977) and Lyrics and Elegies (1958), as well as a number of scholarly books, such as Christian Rite and Christian Drama in the Middle Ages (1965), Toward Freedom and Dignity: The Humanities and the Idea of Humanity (1972), Entering the Maze: Identity and Change in Modern Culture (1982), Prosody and Purpose in the English Renaissance (1989) and Disappearing Through the Skylight: Culture and Technology in the Twentieth Century (1989). While professor of English and comparative literature at the University of North Carolina at Chapel Hill, Hardison was featured in Time Magazine as one of the countrys greatest teachers. He also taught at Princeton and Georgetown Universities. 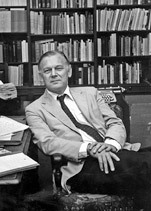 Hardison moved to DC to serve as director of the Folger Shakespeare Library from 1969 to 1983. Under his tenure, he originated such programs as the Folger Poetry Series, the Folger Theatre, the Folger Consort, the Folger Institute, and educational programs for students in grades K through 12. He raised the funds to expand and renovate the Folger Library, which included the introduction of advanced temperature and humidity controls for the rare books collection. He and his wife raised four daughters and two sons. Washington, if it continues to be for 50 years (and I am not so sure that it will), might loom up as a great town.